You like the best of the best, so we put together this sampler to show that we do too. 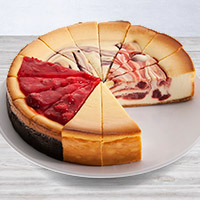 Comprised of New York, Strawberry Swirl, Turtle, Amaretto, Cherry Almond, Triple Chocolate, Cookies & Cream, and Chocolate Raspberry cheesecakes, this ultimate sampler offers a perfect slice for everyone. A great gift! Thanks so much! Very, very delicious! I bought this for my husband for Valentines Day. The package came in on time and it looked great when opened. All the flavors were so good! Hope to order again soon. AWESOME! This is so beautiful. Makes such a nice presentation. Will impress your guests and delicious too!!! Would buy again for sure. And arrived right on time in perfect condition. My son is away at college. He always asks for pie instead of a Birthday cake. So I sent him the Sampler Cheesecake for his birthday. He absolutely loved it! He said that it was huge so he could share with his friends and it was so good! I’m so happy that I found this! It got there in plenty of time and was packed in dry ice (which he also loved). He raved so Mom was Happy! I realized that I forgot to send the yearly Christmas cheesecake to my family on the evening before Christmas eve. In a panic I searched the web and I couldn't believe it when I found out that I could order my cheesecake from Gourmet Gift Baskets on a Sunday afternoon and have it delivered the next day! What a find!! I brought this to my in laws' house for Thanksgiving. Needless to say, I am now the new star son-in-law in the family! Everyone loved the variety and quality of selections available. I will be ordering this one again for various get-togethers and functions. FANTASTIC !!! IT WAS GONE IN 5 MINUTES !!! EVERYONE GOT TO PICK THERE FAVORITE SLICE OF HEAVEN !!! EVERYONE WAS ASKING WHERE I BOUGHT IT !! I bought this for my mother for Mother’s Day, and she absolutely loved it! This was my wifes Mother's day gift, great selection. Loved it. ORDERED NEXT DAY AND WAS TOLD IT ARRIVED IN GREAT CONDITION, PACKED REALLY NICELY. THEY ENJOYED VERY MUCH! always get rave reviews with Gourmet Chesecakes..! 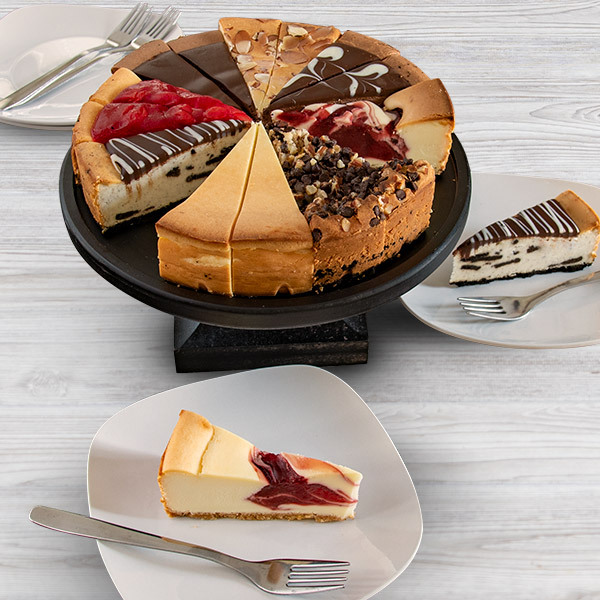 I have sent the cheesecake sampler to several relatives and they all have loved it. Now some of them are sending it to other relatives! Cheesecake nicely displayed and the precut slices are beautiful. Nice office gift with great variety. This was sent as a gift and the comments I received were nothing but praises. I bought two of these an sent them to family. They just loved them and so did everyone they shared them with. Everyone loved the variety to choose from! It was delicious and rich. The leftovers went back in the fridge and great for dessert the next night. Had it during a holiday party and even blended a slice with a few liquids and made the best cheesecake martinis. I bought 2 of them. We usually try to be there for Thanksgiving, but this year was different. Both families received them and actually ate them before the event. Yes, I guess they were THAT good! Got here on time just like you said it would. 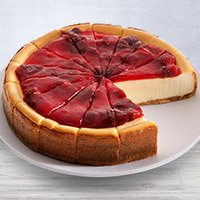 Great cheesecake, The first bite had a lot of ice in it because the cheese cakes come Frozen but still fresh but after that the family enjoyed every slice, so I ordered another cheesecake for my mom and dad to enjoy, and they couldn't say enough great things about it! Sent it to my brother for his birthday. Great variety. His entire family enjoyed it!!!! I got this for my mothers birthday and arrived on time and my mother, who is very particular about her cheesecake, says it is delicious. It is so huge that she's having to freeze half of it and eat on the rest of it for her entire birthday week ! We bought this as a surprise for our sons 21st birthday away a college ! to be able to celebrate with friends he loved it . Sent this as a 'thank you'. Service was great, product was wonderful. It even arrived a day early. This was a very good experience and will us this company again. I ordered this for my sister's birthday. It arrived on a Saturday afternoon, in great condition, and my sister loved it. I could track the package online (shipped via FedEx), which gave me peace of mind. Highly recommend! First off, as soon as I saw this cheesecake, I knew it was The One! My mom loves cheesecake, and is always open to trying new flavors, so I knew the President's Choice was perfect! It arrived a day or two earlier than anticipated, and my mom said it was beautiful, and so glad I bought it for her! It was carefully, and beautifully packed, plus nice and frozen! 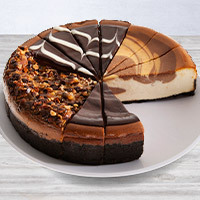 We purchased this Cheesecake Sampler for a customer and they were very pleased. Shipped as promised. Very good purchasing experience. I will use you again for our customer gift giving. It was the birthday cake for my husband. I wanted to make him a surprise. It was a surprise! !!! ....and for me too ... because it arrived at 11 am ... and I did not expected so early because I did not pay extra .... Thank you ! Great taste ! I bought the cheesecake as a thank you to our cousins; they loved it. The portions were good size & having different samplings was wonderful.